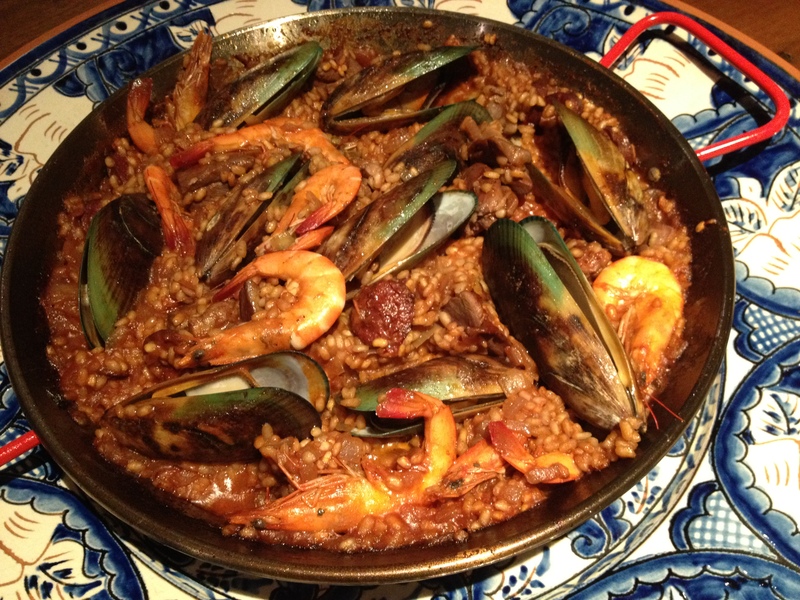 According to my European food bible “Culinaria – European Specialities”, paella is the dish most typical of Spain. It comes from the Albufera region where rice has always been cultivated and eaten and is usually prepared with mussels, squid and shrimps. There are countless versions of this dish however – in the past the rural population made use of whatever ingredients they had available like wild duck, rabbits, chickens, snails, dried beans, and artichokes and peas from their gardens. There’s also a version called fideuà which uses vermicelli type noodles instead of rice. The one luxury ingredient in paella is saffron. Saffron comes from the crocus sativus plant and each flower produces three tiny red strands which are picked, then dried in sieves over the embers of a fire. About 160,000 of these strands are needed to produce 1kg of saffron! No wonder they say it’s more expensive than gold. Luckily you only need a couple of strands to make a paella. The special flat metal frying pan that paella is traditionally cooked in are called paellas and vary in size depending on how many people the dish is serving. 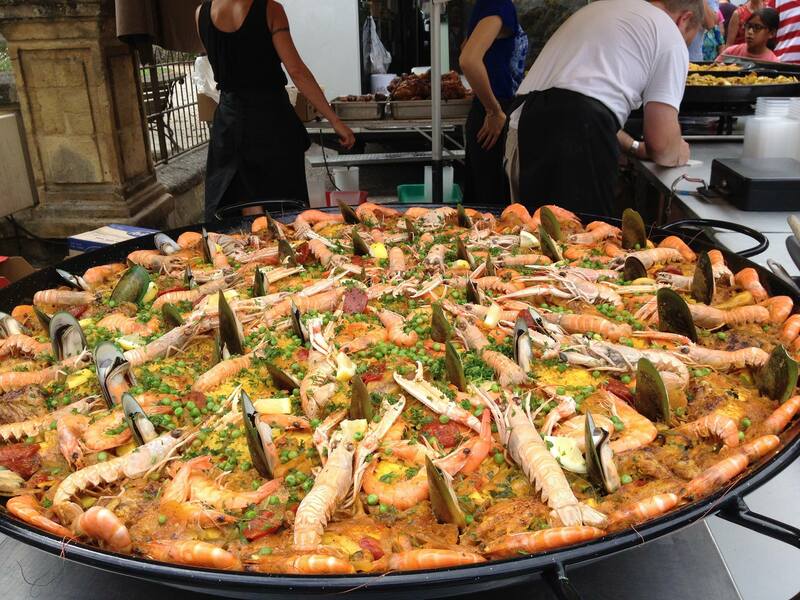 In Europe it’s a common sight to see massive paellas at the market, here’s a giant one we saw at a market in France. Combine the stock and saffron in a medium saucepan and bring to the boil over high heat. Reduce heat to low and hold at a simmer, covered. Meanwhile, heat a large frying pan over medium heat. 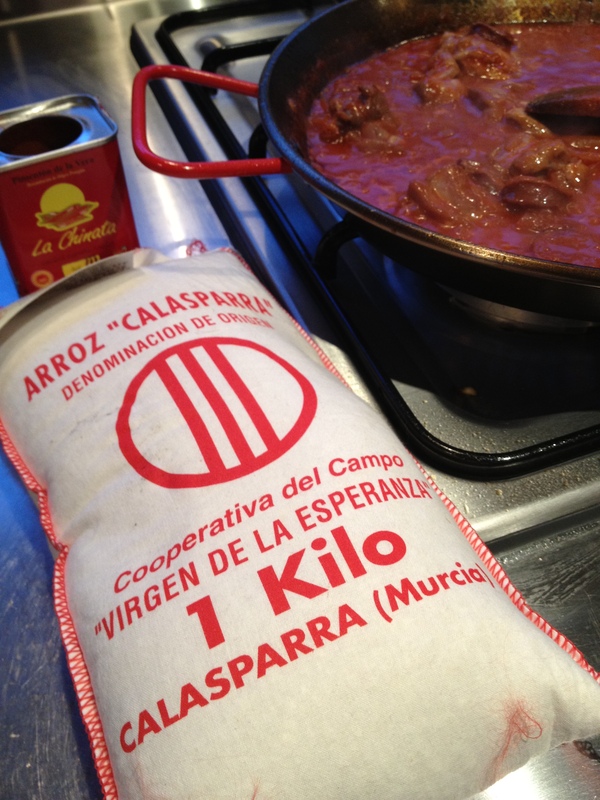 Add chorizo and cook for 1 minute each side or until golden brown. Transfer to a heatproof bowl. Add the chicken and cook, stirring occasionally, for 5 minutes or until golden brown. Transfer to a bowl. Add the prawns and cook, turning occasionally, for 2 minutes or until prawns curl and change colour. Transfer to a bowl. Cover with foil to keep warm. Increase heat to medium-high. Add onion, and red and green capsicum. Cook, stirring, for 5 minutes or until onion softens. Add rice, tomato and paprika and cook, stirring, for 1 minute or until combined. Reduce heat to medium-low. Add one-third of the stock and stir until just combined. Add chorizo and chicken, and simmer for 5 minutes or until liquid is almost absorbed. Add half of the remaining stock and cook for 5 minutes or until almost absorbed. Add remaining stock and cook for 5-10 minutes or until all the stock is absorbed. Sprinkle with peas and add prawns. Remove from heat. Cover with 2 clean tea towels. Set aside for 10 minutes to form a crust, then serve immediately.